I wandered into a colleague’s classroom today just as they were brainstorming some possible topics for writing in their writer’s notebooks. As I found an empty seat, Mrs. K asked her students to open up to a fresh page in their notebooks and do some quick writing about one of the topics they had just brainstormed. Sometimes when I am in a classroom and students are writing, I move around the room conferring with them–asking them how it’s going, offering them the opportunity to engage in what Donald Graves called “oral rehearsal,” or simply observing their process. 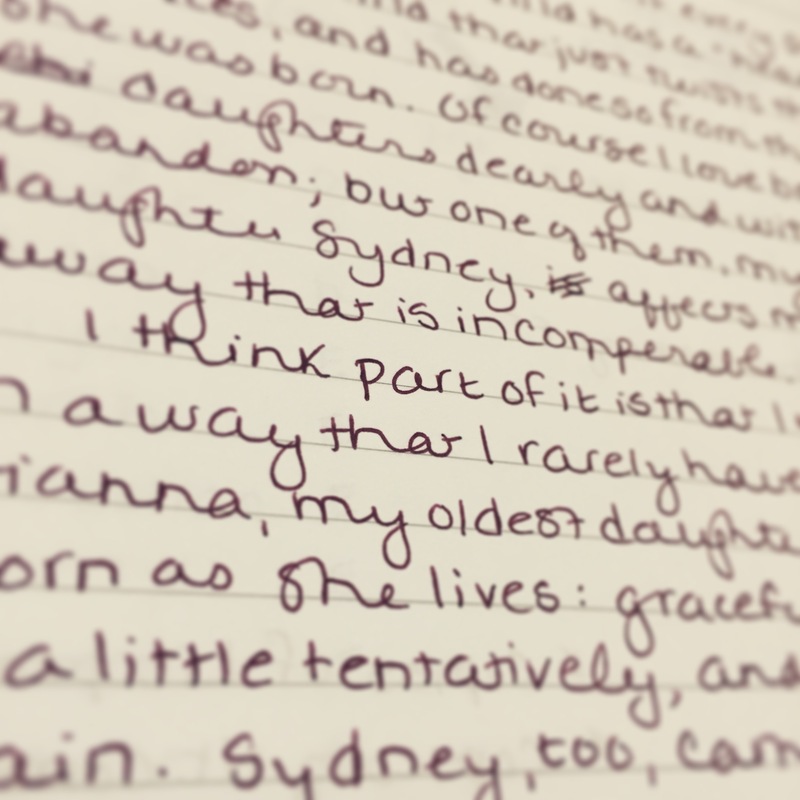 Today, however, as I watched each and every student thoughtfully begin to compose in his or her notebook, I decided that the best thing for me to do at that moment, the right thing for me to do, was…well, to write with them. I had been floating a few ideas of my own around in my head for a couple of weeks. One of those ideas in particular, though, had been as persistent as a little bee during the past several days, buzzing to and fro, this way and that, moving further into my vision before playfully darting away again. Just last evening, I had lain awake during the dead hours between 1:00 and 3:30 am, my mind swirling around all of the things I had on my unwritten to-do list before returning, once again, to that same topic. By the time I stepped into Mrs. K’s room, it had percolated enough that I knew it was time to put pen to paper–and here was my golden opportunity (in the middle of a work day, no less!). I wrote about being a parent, and how, although every parent loves her children in equal measure, those of us who have been gifted with more than one child knows the feeling of having a “heartache kid.” There’s the child (or children) you have who glide through life, occasionally experiencing small bumps in the road, who make everything look easy–unless we’re talking about getting their chores done in a timely manner. These children tend to come into this world just as they move through it: with a quiet grace, a gentle touch, and little (if any) fanfare. They are your saving Grace(s), the one(s) with whom you have an inside joke, with whom you can oftentimes communicate using a single, familiar look. This child begins her life not with a spark, but with a giant bang. She does not glide, but instead tumbles through life–breaking bones, spilling milk, and shattering cereal bowls. She can light up a room just as spectacularly and as suddenly as she can darken it. She is the child who keeps you up at night with worry, whose phantom cry you hear even when she is miles away at sleepaway camp, whose trials and tribulations twist tiny segments of your gut and your heart into hard little knobs. And, as I, and the students, and their teacher wrote, I looked around the classroom and searched for who I thought were their parents’ Heartache Kids. I wondered which of these children were the frequent milk-spillers and the habitual bone-breakers; which caused their parents’ eyes to well up with tears at the start of each school year, knowing that the tether they hold onto so fervently over the summer months would have to be loosened once more–enough so that their child can still soar without becoming hopelessly lost in the clouds. These are the students whose parents might email too frequently, who might be too eager to corner the teacher during Open House. Or they might be the students whose families are so anxious about their chlld’s social and emotional selves that they can barely bring themselves to make eye contact–or even to show up at all. And instead of sighing with exasperation, or rolling my eyes at how these families’ heartache manifests itself–despite their best intentions– I thought about how it manifested itself in my own life, and how desperately I wanted my child’s teachers to understand. And empathize. After Mrs. K. directed us to find a good stopping point for our writing, she asked us to reflect on what we had just composed. “Who feels as though they’ve written something they might want to continue working on?” she asked us. A slew of hands shot up–some small, some grimy–all seeming to twitch with excitement at this composing work that Mrs. K had just made possible. And with them, my own. Next postEdu-“Jargon,” or Professional Discourse?